Since we started our nomadic life two years ago, people often ask, “Don’t you miss your family?” What do your kids think?” To me living physically close to one another isn’t synonymous with being emotionally close. I’ve always believed my primary job as a parent is to love and guide my kids to become educated independent adults who have the confidence to fly toward their own dreams! I think that’s why I like Krismas so much. (It’s always been Krismas at our house because our oldest son is Kristoffer.) There’s a ten year span between our oldest and youngest child and for many years our family has been spread all over. Several years ago we gave up the notion of gift giving (except for the grandchildren) and instead as many of us as possible try to gather together sometime during the holiday season. This past year has been a challenging one for many of our family so we decided it would be a great year to gather in some place warm. 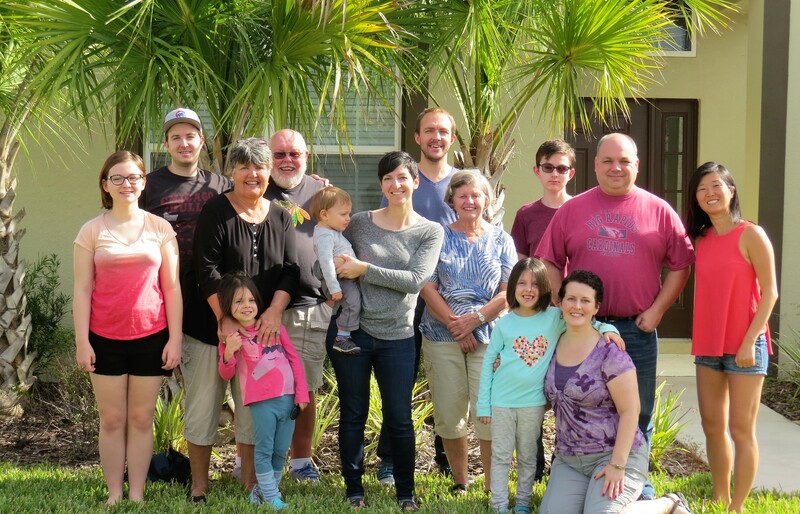 Florida seemed to be the easiest location for everyone to get to. 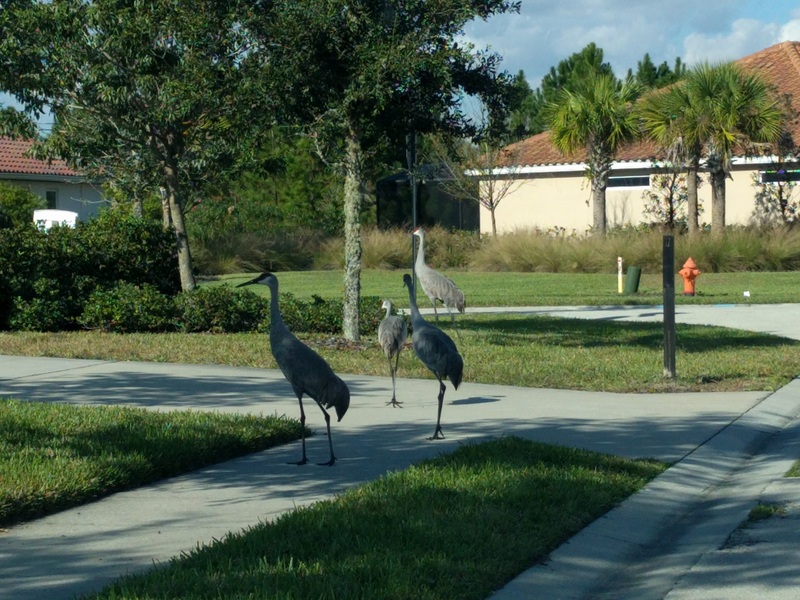 Bob and I found a five bedroom house in suburban Orlando with private pool, less traffic and interesting wildlife. Krismas isn’t a day to us but a time of year. Many young families want to be home with their own kids on the day itself and I think that goes for Stephen’s and Kris’ families as well. All four of our kids and their spouses managed to arrange their calendars so their visits could overlap. Some would be able to stay for a few weeks, others for a few days. It didn’t matter, we’d all have a time together when everyone could catch up, laugh and cousins could have fun and get to know each other better! Another fun game we played was Heads Up. This game is played on the phone with one person showing the clue on the phone while holding the phone on her forehead and her teammate giving clues to get her to say it. This game can be played with fewer people but the drawback is it tends to get really loud so it makes it difficult for others to sleep while the game is being played. I’m sure it didn’t help the noise level that the grown-ups were all consuming large amounts of beer and prosecco as they played! Stephen and his wife, Sadie, have two little girls ages 6 and 4, a perfect age to see Disney. So off they went for a day along with Kris and Alli. The rest of us stayed back. I’d say we did it to babysit Desmond, their 14 month old, but truly Andria, Kris’ wife, had that well in hand. One day some of us drove up to Blue Spring State Park to see the manatees who gather there in the winter in the warm water while others chose to stay behind and see the new Star Wars movie. A big must do for many was an airboat tour. After researching it on the web a decision was made to visit one close by on New Years Day. In the end, nine folks went. They saw a lot of wildlife and because it was a warm afternoon, they got to see a lot of alligators. (Evidently when it’s cool the alligators submerge themselves in the water to stay warm.) The guide started to lift into the boat a small, well maybe not so small, Bob described the gator as about 3 feet from nose to tail. The guide first grabbed it by its back, and then by the tail and as he was trying to hold it closer to the head it nipped him. The guide then reached down and washed his bloody hand in the water. Having situation well in hand he held the gator up and asked if anyone wanted to touch it, no one responded, so he tossed it back into the water. Our four year old granddaughter, Meta, was not thrilled. She snuggled into her cousin and started crying. The poor guide tried to console her, apologizing again and again but she was having none of it. I’m not sure what Meta’s “take aways” were from the experience but I’m thinking she may never ever want to get in an airboat again. But sometime in the future it may make for a pretty good story about the time I was in an airboat and the guide got bit by an alligator. After Krismas Cary’s friend, Claudio, flew in to spend a week with us. (You may remember that we visited his family in Sicily last fall.) It was his first time in the States so Cary felt compelled to provide him with An American Experience. So what would that entail? 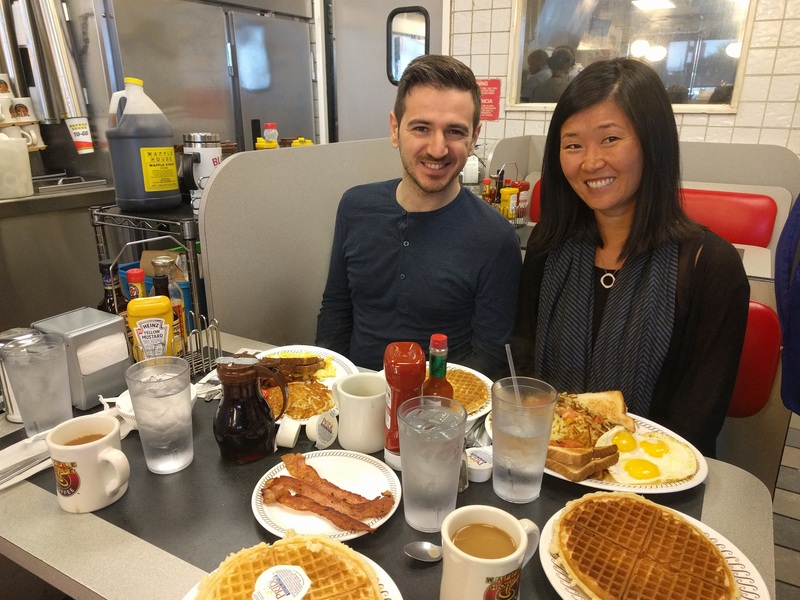 Well, for starters there was American food: Waffle House is a definite part of the American Experience (at least in the south). Absolutely wonderful food, the fact that it perhaps has no nutritional value is a different story. Then of course, he had to try wings. And barbequed ribs! Can’t forget those. 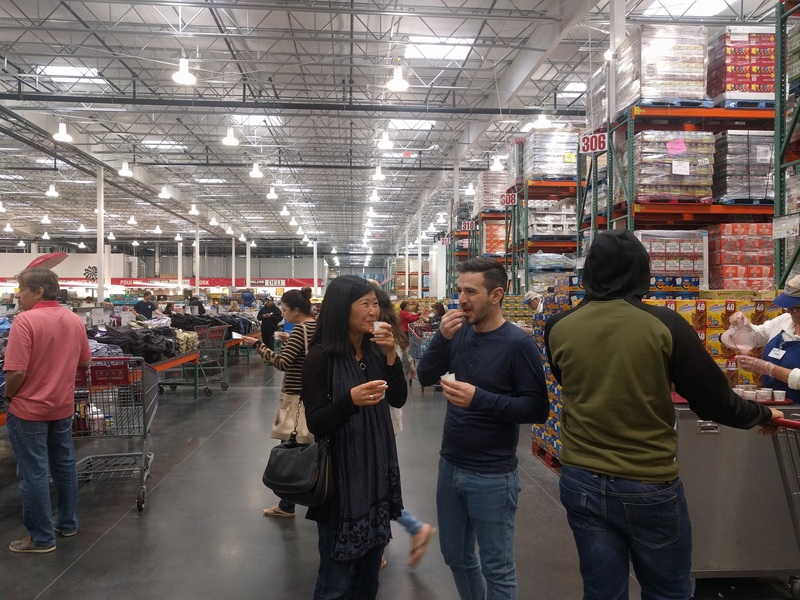 And while we’re on the subject of food…what’s a trip to the US without a trip to Costco and making a meal out of all those samples? Trivia is always a big deal for our family and we had already played once before he arrived. Claudio is fluent in English…fluent enough to play trivia in a second language is pretty impressive! At half time we were in first place, but only managed to get third when the game ended. Even so it came with a gift certificate for a later date but since we were leaving soon, we passed it on to folks at a nearby table. People first arrived on December 20 and too soon it was January 13 and the house was empty except for Bob and me. But oh what happy memories we’ve made: games, miniature golf, swimming, just relaxing and enjoying each other. We feel so lucky to have family who genuinely like, as well as love, each other and look for those times when we can all gather! It truly is a Happy New Year! Jane and Bob — Sounds absolutely wonderful! 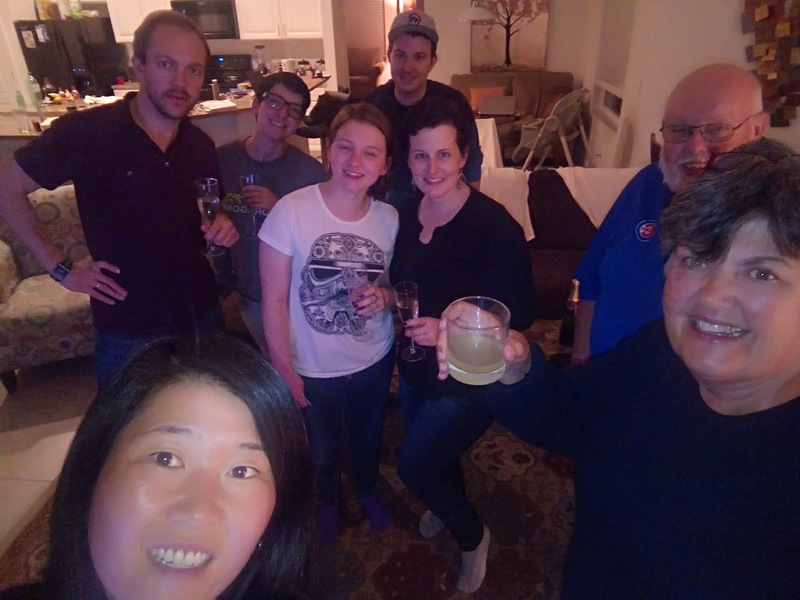 The photos are terrific – like to see all those smiles!